As in past years, our Keynote Lectures will eluci­date specific focal points in the program. In each of these half-hour lectures, an outstanding expert will comprehensively present their important topic. Minimally invasive surgery can be compared to speed mountain climbing. But speed is not the most important aspect. The surgeon should operate with unerring certainty and perform his work with as few movements and tools as possible. 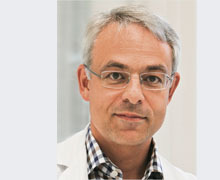 Prof. Dr. Daniel Mojon developed minimally invasive methods for strabismus surgery in Switzerland. He accessed the eye muscle via a small, 10-millimeter-cut into the conjunctiva – a surgical access which before had to be accessed via bigger cuts similar to the shape of wings of a door. Mojon runs his practices in Heiden and St. Gallen. Since 2007 he is honorary Professor at the University of Bern. Minimal-invasive Chirurgie ist vergleichbar mit Speedbergsteigen. Aber Geschwindigkeit alleine ist nicht das Wichtigste. Man sollte mit traumwandlerischer Sicherheit unterwegs sein und mit möglichst wenig Handgriffen und Hilfsmitteln sicher zum Ziel gelangen.